Horseshoes My Way | A scientific approach to horseshoe pitching with many pitching aids discussed/demonstrated. You are here because you’ve chosen my Twitter link, or you selected the link in the Senior Games Athlete Blogs section of the National Senior Games Association, or searched the web for info about horseshoe pitching. This website is a blog which began in the Fall of 2007, when I first began pitching horseshoes. It is a chronology of my search to answer the question, “WHY?”. “WHY” did I miss and what could I do to stop it? It has been a fascinating journey, generating hundreds of questions and answers and is a chronology of 10 years. Using some of the techniques described in this blog enabled me to go from a 0% to 60% ringer average in 2-1/2 seasons. You might be interested in the slow motion videos on Youtube of horseshoe impacts, etc. Once on Youtube, search for “Photon713” to see all available videos. If you are beginner or pro, I will guarantee you will find something helpful to improve your ringer average. If that statement challenges you, stick around and start at the Table of Contents, or my last under development Part 51 Practice Tips, which is a series of tips to bump up that ringer average and points accumulated. My website previously at Hilfling Horseshoes is no longer active. There is also a review of my printed 91 page spiral bound book entitled, “Horseshoe Pitching With Precision” or, sample content of the eReader version in Part 46 Amazon Sample Text. When finished looking around, just hit the back button upper left, to return to your departure point. Thanks for looking, you’re welcome back at anytime. I am always available to answer questions. E-mail me. Hello Bob. Again no questions, just a thank you. After reading a fair bit of your blogs I decided basics were the place to start, very basic since I’ve only been back at this a little more than a month. Had a new pair of Sue Snyder EZ Flip II’s to try out after throwing Challengers for the past 5 weeks. Baby Steps James – find a comfortable pendulum swing with a straight arm and get consistent with that… and that was my total intent. Oddly, and pleasantly, found myself throwing 10 ringers out of my last 24 throws from 40′. Pretty cool stuff. And of the non-ringers I was drawing metal on the vast majority of throws with virtually all shoes arriving in the vicinity of the stake open. Very nice surprise for such a simple aspect. A little like putting in disc golf – reduce the amount of physical variable on the throw and you get repeatability. Again thanks much. Thank You, Jamie…you picked a great shoe in the Snyder EZ Flip II. I had the great honor of meeting Sue Snyder at the 2010 HP Pro Tour event in Frederick, Maryland. It was an odd circumstance. She happened to walk up to my competitor and I and it turned out we were both pitching Sue’s EZ Flip. I had to paint the tips of my shoes to differentiate between the two of us. Sue was excited to find out we were both pitching her shoes. In the above ilistration total distance of 25.5 feet doesn’t seem correct! The stakes are 40 ft apart so if you add the arc I can’t understand the 25.5 total distance! In this example I am speaking of the foul line at 27 feet and the release point at 25.5 feet. The foul line for 40 foot pitchers is 37 feet while the foul line for Elders, youth and women is 27 feet. The measurements were calculated from the 27 foot foul line. In a later part I show the calculation for horseshoes thrown from the 37 foot foul line. The calculations for the high point of flight depend on your release point relative to height and location of release. The example shown is from a release point of 25.5 feet from the stake and 3 feet above the ground. My release point was 1.5 feet in front of the 27 foot foul line. Relative to the 27 foot foul line — an Elder reaching 70 years of age in the calendar year can move up from 40 feet to 30 feet. Women generally pitch from 30 feet, but, can pitch from 40 feet if they wish. Hope that explains the reference to 25.5 feet. The National Horseshoe Pitchers Assn., defines the rules for 30 and 40 foot pitchers. 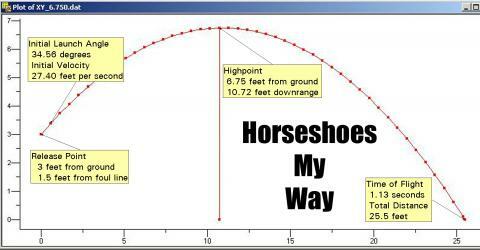 There is a YouTube video that shows the flight of a horseshoe being released and the location of the high point. Search for “Photon713” on YouTube for a number of videos, one specific to this example. Thanks for your inquiry, and hope that clears it up for you. Hi. My name is Don and I have no idea if ur site is still up and running. Anyway, I have recently taken up pitching horseshoes again. Been about 15-18 yrs since I have pitched. Just thought that I would ask u a question or three. I pitch left-handed and have been trying to use the 1/1.4 turn pitch. I seem to have problems with my shoes to land at least open. I have tried tossing the shoes a little higher, lower with more speed, higher on the shoe and lower on the shoe, towards the open on the shoe. I also seem to toss most of my shoes on the right side of the stake. Even though I am 74 yrs young, I feel uncomfortable tossing from the 27-30 ft line, so I toss just in front of the pit. This has nothing to do with my “ego”, but I did try tossing back close to the end of the pit, but found out that it kind of hurts my shoulder somewhat. I don’t know if you can even begin to respond, but if u wish I will gladly read ur comments or maybe even respond with a few more questions. trying to learn to pitch horseshoes. You have described some very common issues. information there, but, work with you via email to this email account. This is what I read from your questions. 2. You’ve been away from horseshoe pitching for 15-18 years. 3. You’re having a little problem with pain in your pitching shoulder. 4. You’re trying to use the 1-1/2 turn. 5. You tend to miss to the right (you’re left handed). 6. Problems with shoe arriving open. 1. Do you have a pit for practice handy, say in your backyard? 2. Do you have time to practice at least 1-2 hours per day? 3. Do you know why your shoe is not arriving correctly? 4. Are you pitching on a court with proper approach and pit? 5. Is your pit sand or clay? 6. Are you a member of the NHPA and intend to pitch in their events? 7. Are you a social pitcher for fun? 8. Do you have any sight issues? 9. Any problem with balance? 10. Finally, what is your personal goal? Let’s start with those questions. You cannot do at 74 what you did in your late 50’s. You cannot throw a 1-1/2 turn from 27 feet. You are already having problems with your shoulder from 37 feet. flexible at 74 as in your 50’s. Where can I buy a set of hilflinger horseshoes and how much are they??? Please and thank you..
My name is Sean and I am very interested in trying to get my hands on some Hilfling horseshoes. I really like to collect and throw unique styles of horseshoes. The Hilfling Grablt have really caught my eyes. Do you by chance know where I may be able to purchase and get my hands on some Hilfling shoes? Please let me know and I would greatly appreciate it. I’ll answer you directly via email. I think your shoes are awesome where can I buy some?